A quality entry of British and Irish riders is set to contest this weekend's Sunflower Trophy races at Bishopscourt. British Supersport riders Alastair Seeley and Glenn Irwin are set to lock horns, with Irwin's team-mate Luke Hedger also entered in the 600cc class. The Superbike field includes Gearlink Kawasaki ace Ben Wilson, newly crowned British Superstock champion Danny Buchan and road racer Dean Harrison. Andy Reid will make his first Superbike appearance on a Milwaukee Yamaha. Jordanstown man Reid has signed to ride for Shaun Muir's team for the next two years, having ended the British Superstock 600cc championship in second place. 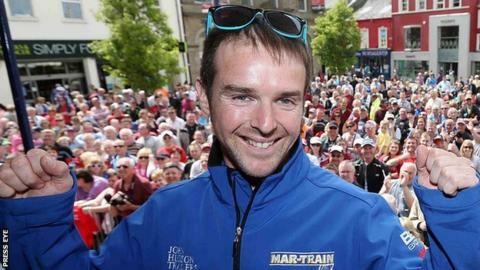 Harrison will compete on a Yamaha for the Lisburn-based Mar-Train Yamaha outfit if he has sufficiently recovered from injuries sustained in a crash at Ireland's Corner during the Ulster Grand Prix. Jamie Patterson is handed a chance to impress in the colours of the Bathams BMW team, which fielded Michael Rutter and Stephen Thompson at the major international road races in 2014. Buchan is joined by Gary Mason in the Tsingtao Racing ranks, reigning Irish Superbike champion Nico Mawhinney also campaigns a Kawasaki and British Superbike rider Sam Coventry is a late entry. MWR Kawasaki have given Supersport regular Carl Phillips a provisional Superbike ride and he is set to be partnered by South African James Egan. Sunflower regular Marshall Neill is an absentee this year however after crashing out at the last round of the Adelaide Masters. The Supersport races have the potential to be the best of the day on Saturday, with Seeley, Irwin and Hedger coming up against Nikki Coates, Jamie Hamilton, Phillips, Robert Kennedy, Patterson, Danny Webb and Christian Elkin. The meeting represents the final round of the Irish championships and a field of 36 will take to the grid for the main event of the day on Saturday, run over 12 laps. Three races will be staged after practicing on Friday, with the remaining 14 events taking place on Saturday. The organising Hillsborough and District Motor Club will be hoping for better fortune after the 2012 meeting was cancelled because a change of date to mid-summer failed to attract the customary quality field of riders and teams. Last year's event was abandoned because a mixture of a serious oil spill and heavy rain made track conditions too dangerous for racing.